On the airfield Maleme Mountain troops landed as reinforcements. 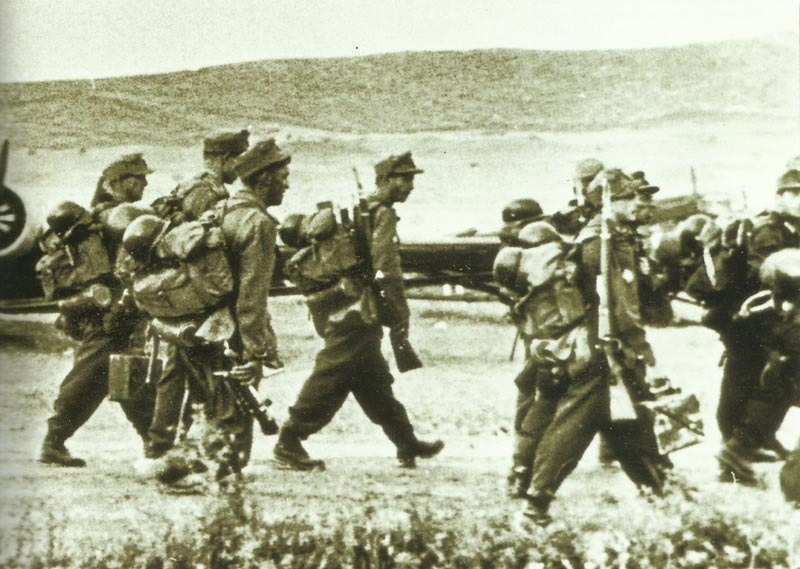 Airborne invasion of Crete: Ju 52s land reinforcements at Maleme. Air War: Kesselring, Commander of Luftflotte 2, moves into his new HQ at Poznan, Poland; this signifies the completion of large-scale transfer of German air forces from the West to ‘Russian Front’. Mediterranean: German bombers, fighter-bombers and Ju 87 Stukas carry out violent attack on British Mediterranean Fleet in Cretan waters; cruiser Gloucester sunk (693 killed), cruiser Fiji crippled and abandoned, destroyer Greyhound sunk, battleship Warspite damaged. 3 British destroyers shell German airborne forces on Maleme airfield, night May 22-23. Decoy and Hero evacuate King George of Greece and his staff from the island.